The hindbrain is the lowermost or rearmost region of the brain that bridges the brain with the spinal cord and includes the medulla oblongata, pons, and cerebellum. It is also called the rhombencephalon, a term that is variously used as a synonym with hindbrain and as the developmental area of the embryo that becomes the hindbrain. 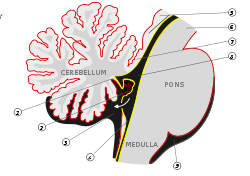 The hindbrain consists of two regions: (1) the myelencephalon, which includes the medulla; and (2) the metencephalon, which includes the pons and cerebellum. The hindbrain can be subdivided in a variable number of transversal swellings called rhombomeres. 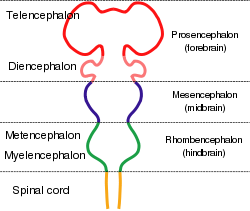 In the human embryo eight rhombomeres can be distinguished, from caudal to rostral: Rh8-Rh1. Rostrally, the isthmus rhombencephali demarcates the boundary with the midbrain or mesencephalon. With the hindbrain evident in casts of 500-million-year-old fossils of jawless fish, and all extant vertebrates showing the same basic hindbrain structure (with only agnathans evidently lacking the cerebellum), one can see exhibited both the unity of nature and evidence of newer forms coming on the foundation of earlier forms. However, the proportions of hindbrain, midbrain, and forebrain also differ considerably among the vertebrates, with the hindbrain the largest portion in fishes and the forebrain playing the more dominant role in terrestrial vertebrates. A rare disease of the rhombencephalon, "rhombencephalosynapsis," is characterized by a missing vermis resulting in a fused cerebellum. Patients generally present with cerebellar ataxia. 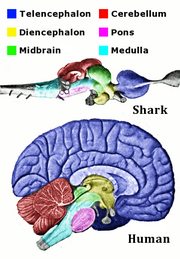 The main anatomical regions of the vertebrate brain, shown for shark and human. The same parts are present, but they differ greatly in size and shape. Vertebrate brains are characterized by three primary divisions: forebrain (or prosencephalon), midbrain (or mesencephalon), and hindbrain (or rhombencephalon). These divisions are discerned even in fossils of agnathans (jawless fish, which today are represented by lampreys and hagfish) from 500 million years ago (Raven et al. 2008). The forebrain is dominant in terrestrial vertebrates, where it is the center of the processing sensor information. The forebrain of reptiles, amphibians, birds, and mammals is commonly divided into two regions: the "diencephalon," which consists of the hypothalamus and the thalamus, and the "telencephalon," or "end brain," which in mammals is called the cerebrum (Raven et al. 2008). The telencephalon also is the term used to refer to the embryonic structure from which the mature cerebrum develops. The midbrain or mesencephalon is primarily is composed of the optic tectum, which processes and receives visual information. The hindbrain or rhombencephalon includes the medulla oblongata, the pons, and the cerebellum. The hindbrain is somewhat like an extension of the spinal cord, with tracts of axons running through the spinal cord to the hindbrain, and the hindbrain integrating the incoming sensory signals and coordinating the motor responses (Raven et al. 2008). The function of the hindbrain is primarily the coordination of motor reflexes, with the cerebellum carrying on much of this coordination (Raven et al. 2008). The midbrain, pons, and medulla also are collectively referred to as the brainstem. Developmentally, the hindbrain also can be subdivided into the myelencephalon, which is the area that gives way to development of the medulla oblongata, and the metencephalon, which gives rise to the pons and the cerebellum. The hindbrain was the major component of early brains, as seen via casts of fossil agnathans, and remains the major part of fish brains today. However, the cerebellum of the hindbrain is lacking in both hagfishes and lampreys (Northcutt 2002). In advanced vertebrates, the cerebellum is larger than in fishes and plays an increasingly important role as a movement coordinating center (Raven et al. 2008). In fishes, the hindbrain is also the largest portion of the three regions (forebrain, midbrain,and hindbrain), while in terrestrial vertebrates, the forebrain has the more dominant role (Raven et al. 2008). The hindbrain is homologous to a part of the arthropod brain known as the sub-oesophageal ganglion, in terms of the genes that it expresses and its position in between the brain and the nerve cord (Ghysen 2003). On this basis, it has been suggested that the hindbrain first evolved in the Urbilaterian—the last common ancestor of chordates and arthropods—between 570 and 555 million years ago (Ghysen 2003; Haycock 2011). The myelencephalon is a subdivision of the brain used to describe the area that gives way to development of the medulla oblongata. Often referred to simply as the medulla, the medulla oblongata is the lower half of the brainstem and along with the spinal cord contains many small nuclei involved in a wide variety of sensory and motor functions (Kandel et al. 2000). 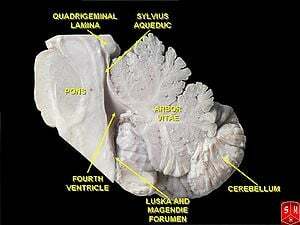 The medulla contains the cardiac, respiratory, vomiting, and vasomotor centers and deals with autonomic, (involuntary) functions, such as breathing, heart rate, and blood pressure, as well as basic reflexive activities (coughing, sneezing, swallowing, vomiting) (Loewy and Spyer 1990). .
During fetal development in humans, divisions that give rise to the hindbrain occur at just 28 days post conception with more specific subdivisions (metencephalon, myelencephalon) taking shape at 7 weeks post conception. Final shape differentiation into the medulla oblongata can be observed at 20 weeks gestation (Carlson 2013). and a portion of the vestibulocochlear nerve (CN VIII). Because of its location at the brain stem, trauma to this area can be detrimental to survival of any kind. Research shows lesions resulting from trauma can cause pulmonary edemas due to the medullas association with pulmonary function (Matsuyama et al. 2007). Similarly, ischemia can also result from lesions to the medulla affecting vasomotor function (Kumada et al. 1979). The metencephalon is a developmental categorization that is composed of the pons and the cerebellum; contains a portion of the fourth ventricle; and the trigeminal nerve (CN V), abducens nerve (CN VI), facial nerve (CN VII), and a portion of the vestibulocochlear nerve (CN VIII). The pons lies in the brainstem directly above the medulla and contains nuclei that control sleep, respiration, swallowing, bladder function, equilibrium, eye movement, facial expressions, and posture (Siegel and Sapru 2010). The pons regulates breathing through particular nuclei that regulate the breathing center of the medulla oblongata. The cerebellum plays an important role in motor control. It may also be involved in some cognitive functions such as attention and language, and in regulating fear and pleasure responses, but its movement-related functions are the most solidly established. The cerebellum does not initiate movement, but it contributes to coordination, precision, and accurate timing. Removal of the cerebellum does not prevent an animal from doing anything in particular, but it makes actions hesitant and clumsy. This precision is not built-in, but learned by trial and error. Learning how to ride a bicycle is an example of a type of neural plasticity that may take place largely within the cerebellum (Kandel et al. 2000). In humans, the metencephalon develops from the higher/rostral half of the embryonic rhombencephalon, and is differentiated from the myelencephalon in the embryo by approximately 5 weeks of age. By the third month, the metencephalon differentiates into its two main structures, the pons and the cerebellum. Rhombomeres Rh3-Rh1 form the metencephalon. At the early stages of brain development, the brain vesicles that are formed are imperative. Each brain region is characterized by its own specific architecture. These regions of the brain are determined by a combination of transcription factors and the signals that change their expression (Nakamura and Watanabe 2005). The isthmus is the main organizing center for the tectum and the cerebellum (Matsunaga et al. 2002). The tectum is the dorsal part of the metencephalon. The tectum includes the superior and inferior colliculli, which play a part in visual and audio processing. Two of the major genes that affect the metencephalon are Fgf8 and Wnt1, which are both expressed around the isthmus. Fgf8 is also known as Fibroblast Growth Factor 8. It is a protein that is widely thought to be the most important organizing signal. Its main function is to set up and maintain the barrier between the midbrain and hindbrain, specifically between the mesencephalon and metencephalon (Matsunaga et al. 2002). It also plays a large role in deciding the structure of the mid- and hindbrain. Wnt1 is a proto-oncogene protein (Wingless-type MMTV integration site family, member 1). This gene was originally thought to play a role in the development of the midbrain and hindbrain, but studies have shown that this may not be the case (Matsunaga et al. 2002). Wnt1 is thought to be behind the genetic disorder called Joubert Syndrome, a disorder that affects the cerebellum. Otx1 and Otx2 are genes that play important parts in the development of the brain and studies have shown that their roles change throughout the brain’s development (Sakuri et al. 2010). It is thought that at the stage of brain development where the rostral brain is regionalized into its different parts (telencephalon, diencephalon, metencephalon, and mesencephalon) that Otx2 and Otx1 protect the caudalization of the diencephalon and mesencephalon into metencephalon (Sakuri et al. 2010). Brink, T. L. 2008. Unit 4: The nervous system. In T. L. Brink, Psychology: A Student Friendly Approach. Retrieved November 16, 2013. Carlson, N. R. 2013. Foundations of Behavioral Neuroscience. Pearson. ISBN 9780205962099. Dafny, N. 2013. chapter 1: Overview of the Nervous system. Neuroscience Online. Retrieved November 15, 2013. Ghysen, A. 2003. The origin and evolution of the nervous system. Int. J. Dev. Biol. 47(7–8): 555–62. PMID 14756331. Retrieved December 10, 2013. Gonzalez, R. 2012. The 4 biggest myths about the human brain. 109.com. Retrieved November 12, 2013. Haycock, D. E. 2011. Being and Perceiving. Manupod Press. ISBN 9780956962102. Kandel, E. R., J. H. Schwartz, and T. M. Jessell. 2000. Principles of neural science. New York: McGraw-Hill. ISBN 9780838577011. Kumada, M. A., R. A. Dampney, and D. J. Reis. 1979. Profound hypotension and abolition of the vasomotor component of the cerebral ischemic response produced by restricted lesions of medulla oblongata in rabbit. Relationship to the so-called tonic vasomotor center. Circulation Research 45(1): 63-70. Loewy, A. D., and K. M. Spyer (Eds.). 1990. Central Regulation of Autonomic Functions. Oxford University Press. ISBN 1429401508. Matsunaga, E., T. Katahira, and H. Nakamura. 2002. Role of Lmx1b and Wnt1 in mesencephalon and metencephalon development. Development 129: 5269-5277. Retrieved December 10, 2013. Matsuyama, T., K. Okuchi, T. Nishiguchi, T. Seki, and Y. Murao. 2007. Neurogenic pulmonary edema caused by a medulla oblongata lesion after head trauma. The Journal of Trauma 63(3): 700. Nakamura, H., and Y. Watanabe. 2005. Isthmus organizer and regionalization of the mesencephalon and metencephalon. Int. J. Dev. Biol. 49: 231-235. Northcutt, R. G. 2002. Understanding vertebrate brain evolution. Integ. and Comp. Biol. 42: 743-756. Raven, P. H., G. B. Johnson, J. B. Losos, K. A. Mason, and S. R. Singer. 2008. Biology, 8th edition. Boston: McGraw Hill. ISBN 9780072965810. Ruppert, E. E., R. S. Fox, and R. D. Barnes. 2004. Invertebrate Zoology, 7 ed. Brooks/Cole. ISBN 0030259827. Sakuri, Y., D. Kurokawa, H. Kiyonari, E. Kajikawa, Y. Suda, and S. Aizawa. 2010. Otx2 and Otx1 protect diencephalon and mesencephalon from caudalization into metencephalon during early brain regionalization. Developmental Biology 347(2): 392-403. Retrieved December 10, 2013. Siegel, A., and H. N. Sapru. 2010. Essential Neuroscience. Lippincott Williams & Wilkins. ISBN 9780781783835. This page was last modified on 21 February 2014, at 17:26.